Poison Ivy finally makes her debut as a villain in Tom King’s new story arc after being written as an antihero for so long, and she is more powerful than ever. With the ability to control everyone on the planet, Ivy is a dreadful threat for both Gotham City and the entire world. In this very short issue, however, it is very difficult to understand what’s going on. Bruce Wayne wakes up visibly shaken, and the realization that the world is controlled by Poison Ivy strikes him. He and Selina Kyle make sure the aren’t under Ivy’s control by injecting each other with an antidote, then the two try to figure out how to stop her. There is not much going on this issue although it’s quite fast paced. However, the issue still manages to be enigmatic and interesting. Poison Ivy’s characterization is quite spot on from what I could see. Tom King understands Batman’s rogues very precisely, and he definitely isn’t scared to portray a character bad to the bone. After Poison Ivy’s transition into an antihero, I honestly couldn’t wait to finally see her go back to being a villain. 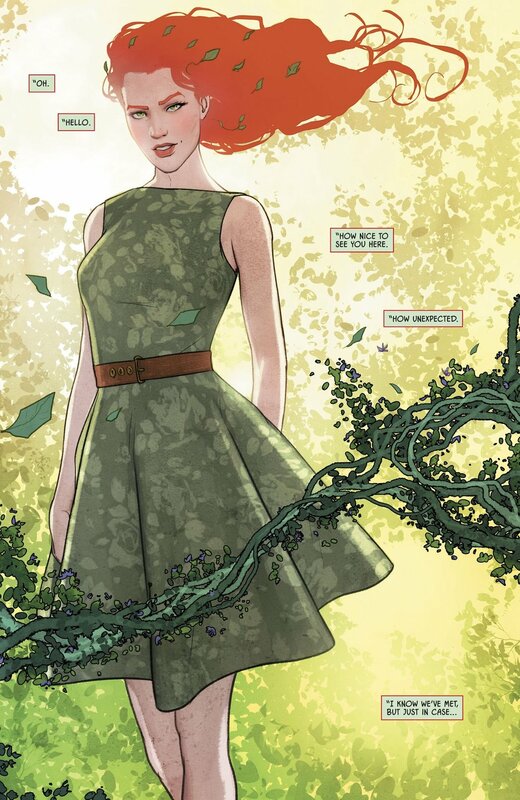 Although most new fans are not excited about Ivy’s mutation into a villain, long time fans couldn’t be happier. As I addressed in one of my previous articles, fans are quite divided between those who are happy to see Ivy back on track and those who absolutely want her to go back to doing some good. It is definitely a problem, since new fans are going to ignore, if not boycott, Tom King’s amazing creative work and writing style simply because he wrote a character exactly as it was supposed to be written from the start. With that said, I hope Poison Ivy’s antihero days are over, since she was largely wasted as a character when portrayed in that way; Ivy has exceeding depth as a villain and her personality comes out prominently. The art of this issue is absolutely perfect, Mikel Janin’s work is mesmerizing as always, and the very first panel of this issue is wonderful. We see, in fact, Poison Ivy for the first time in a sort of celestial dream vision, and it’s incredible; June Chung’s choices of colors are what makes this issue’s art almost unforgettable: she alternates swiftly between very light, pastel colors, to dark and cold colors. Overall, aside from the excitement of finally seeing Poison Ivy go back to her roots, this is an incredible issue even though it’s quite difficult to fully understand what’s going on, as I said. It definitely leaves you craving for more, and the fact that basically nothing is being said about the actual plot of this arc in this issue, only makes me more determined to figure out what’s going to happen. If you haven’t read it yet, a digital copy of this issue can be purchased here.